The Expert 専門家 (Senmonka) is made with a 100% thick canvas core and covered with an outer layer of special high grade satin. It has been described as the "look of silk at the cost of satin". Sewn with 11 rows of reinforced stitching for resilience and a beautiful finish. Available in standard and extra width. For EXTRA WIDTH belts choose one size longer so that the embroidery will not be lost in the knot when tied. It is designed to last and wear down gradually giving it the desired time honored look. Tokaido Japan provides the highest quality embroidery in Japanese or English. No company can surpass the level of embroidery perfected by Tokaido. The secret in the manufacturing of our belts is that the parts are cut and embroidered separately before being assembled and sewn together. This is the reason why they are so strong, neat and beautifully finished. The embroidery will not show through on the reverse side. This is the hallmark of a true, Made in Japan - Tokaido Black Belt. 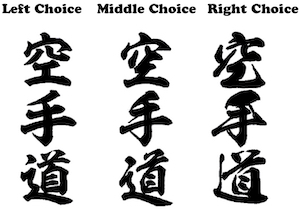 Middle Choice 太行書 translated as “Bold Cursive”. Right Choice 龍神 translated as “Dragon God”. Each kanji font has it’s own character with the Left Choice described as crisp and clear, the Middle Choice characterized as strong and bold, and the Right Choice as sophisticated and detailed. TOKAIDO is happy to provide this choice and we hope you will appreciate these new options. Please note: the Left Choice 昇龍 “Rising Dragon” is the default font and will be used if neither of the other two are chosen. You may choose to embroider your style name and/or your personal name. For Japanese text, please select from the pop up menus by clicking on the Kanji Style Names or the Names in Japanese Katakana below the field that you desire. If your Style or Name is not in the menu then use this Google Translate link https://translate.google.com/#en/ja/ to CREATE and then COPY and PASTE into the field(s) you desire. We will confirm that the translation is correct before production. If you prefer English/Roman letters, then type directly in the field(s) of your choice. As with all black belts that are made in Japan by Tokaido Japan, each one is made as it is ordered. This way we can ensure that you receive the best kuroobi possible. Currently un-embroidered belts require 2 weeks and embroidered belts require 5 weeks. This is my 3rd belts that I have ordered from Tokaido. Their craftsmanship and professionalism are beyond excellent. Shipmment is very reliable as well. Super communicative consumer service. Than you so much! I purchased a tokaido satin black belt eith silver embroidery for my son as a gift. Customer service is excellent! The quality of the goods allso excellent. I would highly recomend this company. Beautiful belt, and fabulous service. They picked up my mistake in my order and corrected it, very appreciated! Tokaido's reputation for being one of THE names in karate is well deserved. The belt is top quality and at a reasonable price. Service from Tokaido was courteous and prompt. Shipping time was reasonable in my opinion - shipped all the way from Japan to US in only a couple of weeks. I highly recommend Tokaido! I have purchased different Black belts and never really liked them, so I tried to find the best quality belts for me and my Dojo and I have found them. I personally really like the Satin belt with a Black uniform. It is a good contrast and the quality and communication is wonderful. I've been using this belt a couple of times a week for about a month now, and it is wonderful. Of course, the satin makes it somewhat difficult to keep tied, but I keep it tied by tucking just the left side in between the layers and pulling the knot tight. This doesn't cause the belt to sit funny at all, and the knot is actually a bit flatter than usual, and, for the most part, stays tight. Make sure when ordering, you order the right size, and take into account the number of characters. My waist is about 36" and I ordered a size 9. A size 8 would probably have been a fine length, but I feel the embroidery would have run just about up to the knot. One side of my belt has 日本空手協会, along with the label, and my name, on the other side, has 9 katakana characters. With the belt tied moderately tightly, the top of the lettering is about 4 inches from the knot. Had I gone with a size 8, the embroidery would have been a bit closer to the knot than I would like. Additionally, I ordered a wide belt, which shortens the ends slightly as well. I am about 6'3" and the belt hangs a couple of inches above my knees. I am extremely happy with my belt. I've gotten many compliments, and look forward to many years of wearing it. After 40 plus years of using Tokaido products I won't even consider another brand. Quite simply, this belt is just as I have come to expect from Tokaido. It has beautiful embroidery, high quality materials and superb workmanship. As I was somewhat limited in explaining the katakana spelling of my name on the order site, I was able to identify my unique requirements through the marvelous folks at customer service. What an absolute pleasure they were to work with. As always, Tokaido will be my source for all of my karate needs. Thanks for continuing to uphold such high standards for your merchandise. Will always buy all of my belts here from now on. Takes about 5 weeks to get but worth the wait! Click the button below to add the Expert BLS 専門家 Satin Black Belt to your wish list.